U.S. President Barack Obama speaks about the Bastille Day truck attack in Nice at the Diplomatic Corps Reception at the White House in Washington, July 15, 2016. Tragedy overshadowed what President Barack Obama had planned Friday as a pleasant reception for the Washington diplomatic corps at the White House. As he has had to do many other times recently, he began his remarks at the event by addressing another mass attack. "We come here with heavier hearts than normal," he said. "Overnight in Nice, we witnessed another attack, an appalling attack on freedom and the peace that we cherish. Today, our hearts are with the people of France and all the innocent men and women and so many children who were hurt or killed in this sickening attack." Obama welcomed French Ambassador Gerard Araud and said he had spoken with French President Francois Hollande earlier in the day. “We pledge to stand with our French friends, and we defend our nations against this scourge of terrorism and violence. This is a threat to all of us,” Obama said. The president referenced recent attacks alleged to have been inspired by Islamic State terrorists in Turkey, Iraq, Bangladesh and Saudi Arabia, noting that many of the victims were Muslims. He said the anti-terrorist coalition of 66 countries would not relent and would destroy what he called the “vile” Islamic State group. He said the coalition would win the fight by staying true to its values of pluralism, the rule of law, diversity and freedoms of religion, speech and assembly. Obama said in this world of 7 billion people, the hatred and violence of a few was no match for the love and decency of so many. Without mentioning anyone by name, the president rejected any suggestion of testing Muslims in America for their beliefs, calling this “repugnant” and “un-American." Former House Speaker Newt Gingrich speaks before introducing Republican presidential candidate Donald Trump during a campaign rally at the Sharonville Convention Center in Cincinnati, July 6, 2016. On Thursday, he called for testing all U.S. Muslims and deporting those who "believe in sharia law." 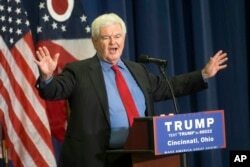 Gingrich was said to be one of the leading candidates to become Republican presidential candidate Donald Trump's running mate, but on Friday, Trump tweeted that he had chosen Indiana Governor Mike Pence for the position. Trump reacted swiftly to the Nice attacks, tweeting, "Another horrific attack, this time in Nice, France. Many dead and injured. When will we learn? It is only getting worse." His likely Democratic opponent for the White House, Hillary Clinton, also reacted to the attacks on Twitter: "Every American stands in strong solidarity with the people of France." At Friday’s White House briefing, press secretary Josh Earnest said French investigators had concluded that Thursday night’s truck attack was a terrorist attack. Earnest said Obama had pledged not only to stand with the French, but also to provide them with whatever assistance they required. Asked about what could be done to stop the quickening pace of terrorist attacks, he said the U.S. already had increased its sharing of intelligence with France and other European countries. Earnest said there needed to be more sharing of intelligence, though, among European allies. Asked whether the president was worried that something similar could happen in the United States, Earnest said officials were very concerned about the possibility of lone wolf attacks, saying that even one single person can wreak terrible carnage. Who Is the Nice Attacker?